The Missouri S&T Solar Village has been around since 2002 when the first house came home from competition. Did you know? Not everyone in the Rolla community did either. The village has been a sort of “best kept secret” of S&T, and many lucky residents have called it home. However, throughout the years it has suffered much wear and tear. The Missouri S&T Solar House Team has transported every house to and from the National Mall in Washington D.C. Many house sections have been exposed to weathering that would not have been a concern if the home had been built stationary. All of those problems were solved last summer 2010 when the village underwent a face lift. Three Solar House team members along with Physical Facilities employees worked through the summer to get the village problems fixed. The exterior siding on the 09, 07, and 02 were replaced due to damage and wear-and-tear. In the 2007 house a lot of improvements were made. A new front door and a railing around the front and back porch were added. The photovoltaic array was rewired, the water pumps were fixed, and the roof was replaced. The 2009 house was in storage over the winter and suffered some damage due to weathering. The basement was poured for the house and it was moved to its final location as the last addition to the Solar Village. The interior floor was replaced, the solar thermal system and home automation systems were fixed, and the interior was repainted. In addition, the thermostat, heat pump, and electrical systems were all given a tune-up to make sure everything was running smoothly. As far as the Village exteriors, concrete was poured for the sidewalks connecting the houses. The grass and sprinkler systems were installed and all the houses were nicely landscaped with local plants. We even got a brand new sign to signify the Village as a part of the University and to make sure everyone knows what is is. Now the Village is up and running with new tenants and a new place at the University. A variety of groups go on tours, professors conduct research, and the residents installed composting bins and a green house. Anyone who remembers the local “eye-sore” of the 2007 house water damage is sure to be amazed at the transformations that have occurred in the Missouri S&T Solar Village. What could be better than the power and convenience of solar energy? As long as the sun keeps rising up off our horizon, we should have more than enough energy to absorb and use, right? Well, that may be true for most days, but not all. Because of this inconsistency in daylight, solar energy has been viewed as “unreliable,” and therefore not good enough for our ever-growing appetite for power. But that may change thanks to civil engineer Mike Strizki. When posed the issue of unreliable solar power, he turned to another green technology to compensate: hydrogen fuel cells. During the summertime, Strizki’s 150 solar panels produce more than enough energy for his house in New Jersey. But during the winter, the panels fall short of their energy quota. So to make up for this deficit, all extra energy produced is sent to an electrolyzer. There, the extra energy is used to split the molecules of purified tap water into hydrogen and oxygen and then vents the oxygen and sends the hydrogen to on of 11 tanks. When he needs more energy during the winter or on a cloudy day, he can use hydrogen fuel cells to convert the stored energy back into usable electricity and continue enjoying life off the grid. But such a project as the Hydrogen House didn’t come without a price. Strizki invested about $500,000 in the operation, and says the cost has now come down to $175,000- the price tag for another such building in the Cayman Islands where he recently installed the technology. Actually, the cost could come down further to about $60,000 if the mass production of components achieved economies of scale. Even though this price is drastically lower and the technology eventually pays itself off, it’s still more than what a majority of people can afford up front, but there’s still hope. Strizki foresees the technology becoming financially attractive if it’s adopted on a community-wide scale. To transition from non-renewable resources to hydrogen-solar technology, a revolution is in order. A revolution Strizki is looking forward to leading. Because of his technology, Strizki has been living off the grid since 2006 and has become the voice of the Hydrogen House ever since. Seeing the potential this technology holds, Mike Strizki is convinced that hydrogen-solar technology is a powerful tool if we are going to topple our old energy habits. With it, the solar revolution has taken one more step to reliability, and therefore, we have taken one more step to a healthier, smarter world. Passive solar technologies have been used to regulate temperatures since the days of early man. In the past, these techniques were used out of necessity due to the lack of current technology. Now, passive solar designs are environmentally friendly and cost effective solutions to modern heating, cooling, and lighting techniques. So what are passive solar designs? The idea of passive solar designs is that the energy from the sun will provide heating, cooling, and light for a desired environment. Simple designs are common for passive solar, as most designs revolve around windows, shade, angles, and materials. For the most part, the designs do not move and have no mechanically powered equipment at all. The design can begin with the orientation of the building. The ideal configuration includes elongated N-S walls, with the building facing as close to true south as possible. Overhangs can be designed to block the sunlight from entering the home on the hottest day of the year, but will allow that sun to heat the space during the coldest. Ample south-facing windows can be used to naturally light the space. All these techniques help reduce the requirement for HVAC and electrical lighting. One technique of using passive solar energy is Trombe walls. Trombe walls are sun-facing walls that contain multiple layers of vents and insulation, effectively acting as a solar thermal collector. These walls can be made of stone, concrete, adobe, or water-tanks. Instead of vents, there can also be water pipes included in the walls to produce a solar hot water system. Almost any physical object that can be used as a solar thermal collector and is exposed to the sun can be used for passive solar energy collecting. of paying for the upkeep and supplies for your gas or charcoal grill? refrigerator to be used in other solar recipes, like the next one! 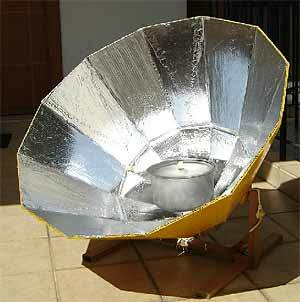 a couple of those SOLAR BAKED POTATOES and place them into a dark pot. hot- about an hour or so. Real easy- REAL GOOD! all the possibilities to use maybe on houseboats to speed boats and barges!